The Dutch general elections are seen as a litmus test of the strength of far-right and populist parties ahead of other ballots in Europe. THE HAGUE: Millions of Dutch voters were going to the polls Wednesday in key elections overshadowed by a blazing diplomatic row with Turkey, with all eyes on the fate of far-right MP Geert Wilders. Following last year's shock Brexit vote, and Donald Trump's victory in the US presidential polls, the Dutch general elections are seen as a litmus test of the strength of far-right and populist parties ahead of other ballots in Europe this year. Amid the tussle between outgoing prime minister Mark Rutte and his anti-Islam rival Wilders, many of the 12.9 million eligible voters were still hesitating between the 28 parties in the running. Most polling stations opened at 0630 GMT, although a few such as at Eindhoven airport were allowed to open earlier. Polling booths set up in schools, town halls as well as shops, bowling alleys and swimming pools will close at 2000 GMT with exit polls expected shortly after. "When people look for leadership, they look to me," Rutte told a final debate late Tuesday. The leader of the Liberal VVD party, he is bidding for a third term as premier of the country of 17 million people -- one of the largest economies in the eurozone and a founding father of the European Union. Final polls appeared to show Rutte pulling away from Wilders, crediting the VVD with coming top with 24 to 28 seats -- well down on its 40 seats in the outgoing parliament. Wilders was seen as slipping, barely clinging on to second place with between 19 and 22 MPs -- well up on the 12 MPs his Freedom Party (PVV) had before. "I am hoping for a strong centre" coalition with Rutte joining forces with other traditional parties, said Alexander van der Hooft. He was the first person to cast his ballot at the Wolters School in a leafy suburb in The Hague, where Rutte was expected to vote later. "But I'm afraid it's going to be very fragmented and difficult to form a government," he told AFP. 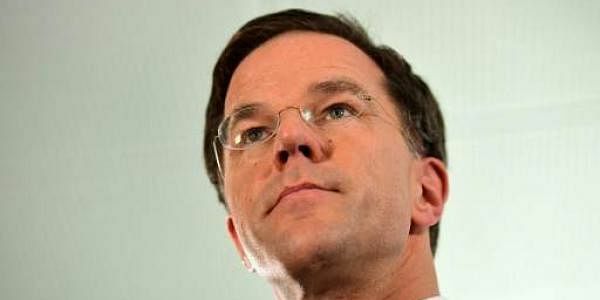 Rutte and his government officially resigned late Tuesday ahead of Wednesday's vote. Seeking to mark his differences with the fiery, Twitter-loving Wilders, Rutte has been highlighting the country's economic growth and stability during his six years at the helm. Complicating the political landscape, Turkey has gatecrashed the scene with Turkish President Recep Tayyip Erdogan unleashing a string of invective at the Dutch for barring his ministers from addressing a pro-Ankara rally in Rotterdam. Rutte's firm handling of the crisis -- barring one Turkish minister from flying into the country, and expelling another -- appears to have boosted his image here. Snapping at the heels of Wilders are long-standing Dutch parties such as the Christian Democratic Appeal (CDA), credited with 19 to 21 seats, and the Democracy Party (D66) with around 17 to 19 MPs, the polls said. Both the CDA and D66 would be natural coalition partners for Rutte, who like most Dutch parties, has refused to work with Wilders, turned off by his incendiary rhetoric. "Netherlands does not belong to all. Do you hear me? The Netherlands belongs to the Dutch," Wilders said in Tuesday's debate. Wilders has pledged to close the borders to Muslim immigrants, shut mosques and ban sales of the Koran. He also wants to pull the country out of the EU in a so-called Nexit. The Dutch pride themselves on their consensus politics, and reportedly it takes an average of three months to cobble together a coalition. Observers predict this time round however, four or even five parties may be needed to reach the 76-seat majority. The leader of the Labour Party, Rutte's coalition partner in the outgoing government, hit out at Wilders in some of the fiercest exchanges late Tuesday. "You've been a member of parliament for 20 years. You've sent thousands of angry tweets, but you have provided zero solutions. You weaken and divide The Netherlands," said Labour leader Lodewijk Asscher. While traditional Labour appears to be sinking this year, the left-wing GroenLinks and its charismatic young leader Jesse Klaver are enjoying a huge boost. His party may win 16 to 18 seats, which could place him in a powerful kingmaker role.